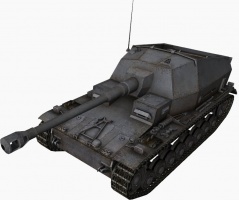 The Dicker Max is the first in the Premium Tank Destroyer line of the German tree. 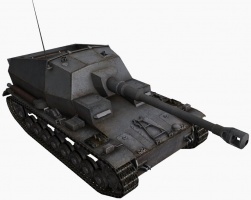 It boasts a good ability to engage tanks from a distance: with the highest available view range, and gun stats that rival the Tiger, with surprisingly good alpha damage at its tier. The Dicker Max's defense boasts of the second best gun depression on the game, but paper armour and the mediocre camo. Given aim time, this gun reliably damages most enemies and will only struggle against tier 8 tanks. Players using the D. Max should be aware that the tank will not survive being shot at whatsoever, but especially HE shots or close fights. It's best used as a flanker-ambusher waiting for the enemy to get closer. For its size, it also has a somewhat decent camouflage value, and if equipped with camouflage module and crew training it can become a serious threat for enemies closing in. As downsides, it has a restrictive gun traverse and lacks the ability to quickly relocate. It also has somewhat low ammo capacity. 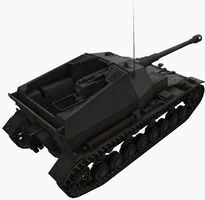 Overall the tank is a solid choice for those who enjoy ambushing targets and are seeking a moneymaker or crew trainer. The increased tension in Europe in the late 1930s forced many nations to accelerate development of new armoured vehicles. This also applied to the cause of that tension: Germany. The war was inevitable, and the offensive power of the army grew day by day. Meanwhile, European countries, including France, Czechoslovakia, and Belgium concentrated their efforts on defensive measures. One of those measures was fortifications. The Maginot line is the most famous of them. In 1936, Czechoslovakia began building a defensive perimeter known as the Beneš line. It included an impressive 250 bunkers and almost 10,000 light fortifications. The Belgian KW line was even more impressive. The upcoming blitzkrieg wouldn't be a walk in the park, at least in theory. The Germans didn't sit on their hands either. In 1938, the German army reclassified the Flak 18 88 mm AA gun into a dual purpose weapon. Now they would be also used against fortifications and tanks. Special units to combat enemy fortifications were hurriedly formed. It became obvious that towed guns protected by only a gun shield were inadequate for this task. A logical solution was to launch a program to develop a special SPG. 10.5 cm K 18, the main gun for the prospective bunker buster. The German Flak 18 gun was powerful, but far from the best fit for the role of a bunker buster. The 10.5 cm schwere Kanone 18 was a much more appropriate weapon. 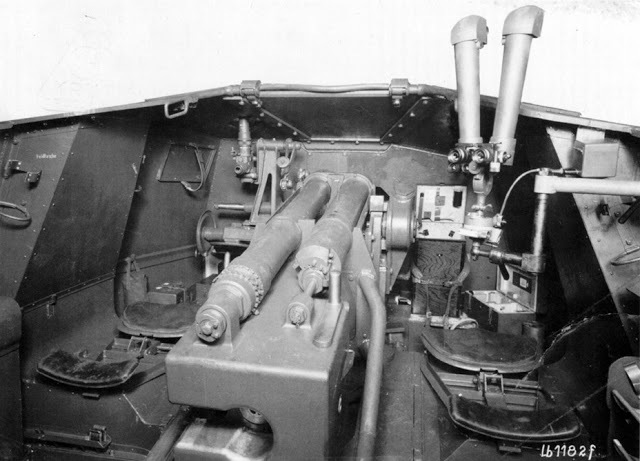 This 52 caliber long gun on the mount of the sFH 18 149 mm howitzer was superior to the Flak 18 in many characteristics. 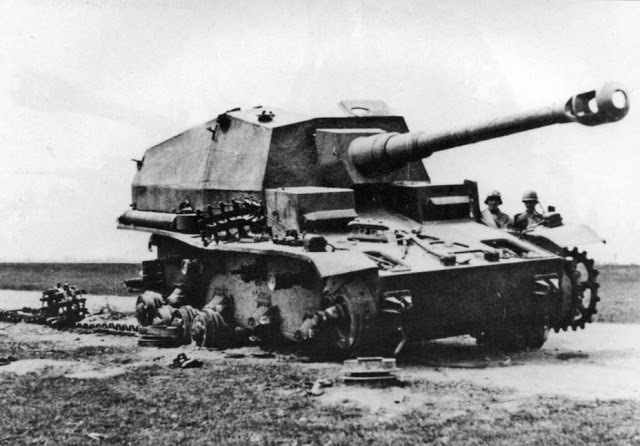 It is well known that AA guns were widely used as anti-tank weapons, but a lesser known fact is that the Wehrmacht actively used the 10.5 cm K 18 as well. This was especially true on the Soviet-German front in 1941, where the gun frequently came up against the KV-1 tank. Reworked 10.5 cm K 18 for installation into the self propelled gun mount. This gun was selected as the weapon for the SPG. During the design stage, it became obvious that the artillery system will have to be redesigned. The problem was that there wasn't a wide choice of chassis available for such a large gun, and the requirements for the internal layout were unyielding. The gun was altered significantly for this purpose. For starters, a massive two-chamber muzzle brake was added. The gases it emitted raised a cloud of dust and revealed the position of the SPG, but the recoil length was significantly shortened. The barrel also became segmented. Pz.Sfl.IVa at the factory, early 1941. There was no alternative when it came to selecting a chassis. The contract was won by Krupp, as the chassis of the B.W. (PzIV) was the most appropriate. Work on the 10.5 cm K. L/52 Selbstfahrlafette (105 mm K 18 gun on a self propelled mount) began in 1938. Two draft projects were presented on April 25th, 1939, by which time an assault on Czechoslovak fortifications was no longer relevant. The drafts differed in layout. Blueprint W1299 placed the engine behind the gun. This lowered the bore axis to 1.7 meters and was preferred by Krupp engineers. However, when it came to the size of the fighting compartment, this variant was sorely lacking. The second variant, blueprint W1298, placed the engine under the gun. This made it difficult to service and raised the bore axis to 2 meters. The pressure on the front road wheels also grew. However, the fighting compartment became significantly roomier, and the overhang of the barrel decreased by 80 cm. 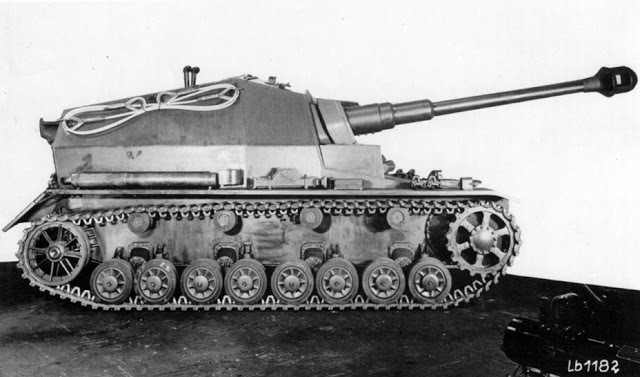 The second variant was selected by the 6th Waffenamt. Initially, the design envisioned an agile vehicle, equipped with the 12 cylinder Maybach HL 120 320 hp engine. This idea was quickly rejected. The engine took up too much space which was so sorely lacking for the fighting compartment. Looking from the right, the fake driver's cabin is clearly visible. A new variant of the SPG was presented on May 2nd, 1939. Blueprint W1300 shows a vehicle equipped with the 300 hp Maybach HL 116. Even this variant did not live for long. The engine was too tall, and an even smaller engine had to be found. This was the six cylinder Maybach HL 66. In theory it output 200 hp, but in practice it turned out less powerful, putting out only 180 hp. The mobility of the prospective vehicle dropped sharply. On the other hand, the targets that it was designed to fight against weren't going anywhere. Meanwhile, Krupp's designers continued to experiment. On May 15th, W1301 and W1303 were presented. The first used the Maybach HL 116 engine with the engine and gearbox shifted to the side. The mass of the SPG became 24 tons. W1303 weighed 22 tons, and the Maybach HL 66 engine was installed behind the gun. The issue of using a torsion bar suspension "borrowed" from the Z.W.38 tank (future PzIII Ausf. E) was also raised at this time. On May 23rd, a new version of W1303 appeared, W1307, where the vehicle had a six-wheel chassis with a torsion bar suspension. The result was very compact for such a powerful gun. The SPG, renamed Pz.Sfl.IV (10 cm), began taking its final form towards the end of the summer of 1939. The designers were fighting to reduce the weight of the vehicle. In this struggle, they were in direct opposition with the 6th Waffenamt. Calculations showed that the spring suspension from the PzIV was 430 kg lighter than the torsion bar suspension. This was the deciding factor for the choice of suspension, as it helped reduce the vehicle's weight to under 20 tons. 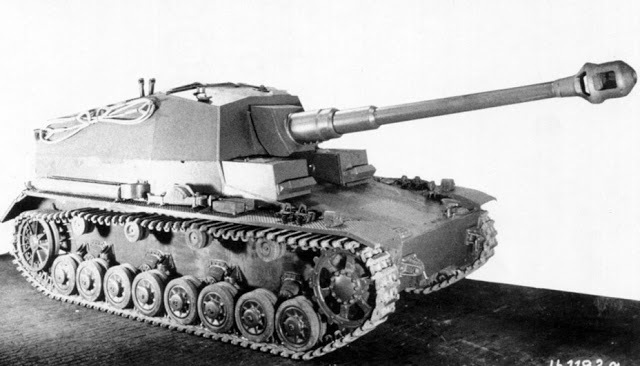 As a result, the military was forced to give in and give permission to build two full Pz.Sfl.IV (10 cm) on the PzIV chassis and one experimental chassis with 6 road wheels per side. The latter was never built. In September and October of 1939, the final characteristics of the SPG were calculated. With an effective power of 9 hp per ton, the planned top speed of 35 kph seemed too bold, and was decreased to 27 kph. The new vehicle was very much in demand with the Wehrmacht. 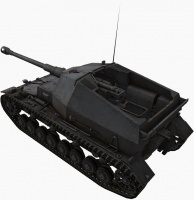 According to documents, the overall order for Pz.Sfl.IV (10 cm) numbered 100 vehicles. The first prototypes were planned in May, but the deadline was moved further and further back. Finally, two SPGs were built at Grusonwerk only in January of 1941. By then, the need for bunker busters was gone. Belgium lasted less than three weeks, France less than six. 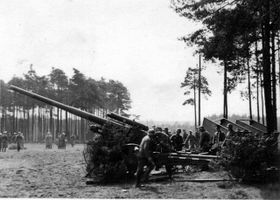 Instead of bunkers, German artillery was shooting at mobile targets. In January of 1941, the main target for the Pz.Sfl.IV (10 cm) was heavy tanks. Mass production of the SPG was postponed. The vehicles built in January of 1941 differed from the initial concept proposed by Krupp in the spring of 1939. The PzIV Ausf. E served as the base for the vehicle. The suspension, the configuration of the "tub" and the location of the transmission remained unchanged. Moving the fighting compartment to the rear of the hull forced some changes. The engine was moved to the center of the vehicle, underneath the gun breech. Since there was no room for air intakes, they had to be placed along the sides of the casemate. 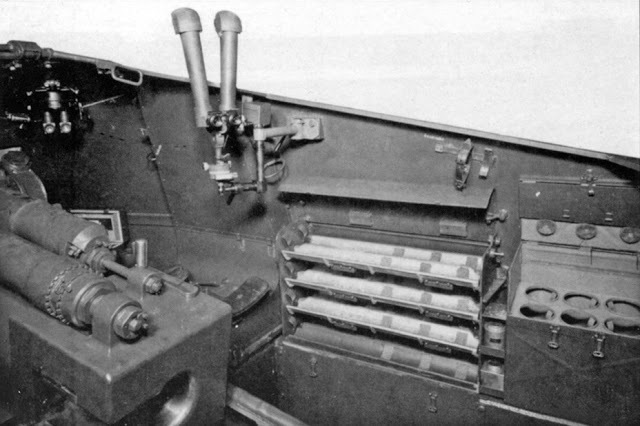 The gunner and commander were placed in the front of the fighting compartment, the two loaders (the gun had a two-piece round) in the back. 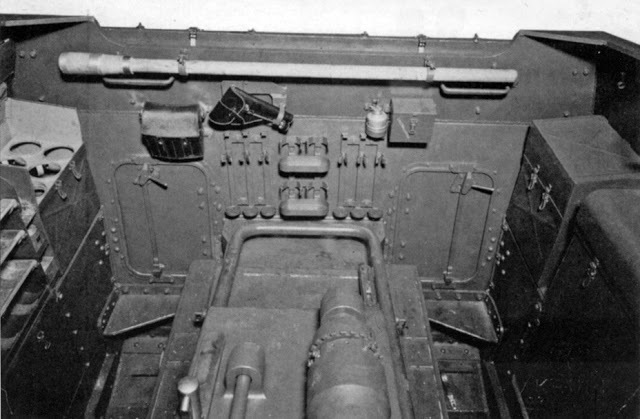 The work to optimize the fighting compartment paid off: the casemate was rather roomy. The fighting compartment height was 1850 mm, so the crew could work while standing. On the other hand, the ammunition capacity was low, and consisted of only 26 shells. The crew entered the vehicle through two small hatches in the back. The view from the rear shows the hatches that the crew used to access the fighting compartment. The placement of the driver was done in an unusual way. A separate cabin was made, which he entered through a hatch on top. A fake cabin was installed on the right of the vehicle, complete with an imitation of an observation device. 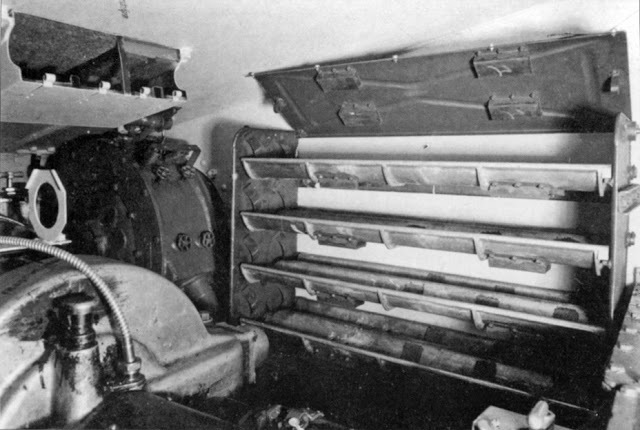 Krupp's engineers had to make creative decisions to make the fighting compartment roomier. For example. the air intakes are very unusual. The resulting vehicle differed drastically from the subsequently designed medium self propelled mounts. Unlike them, the Pz.Sfl.IV (10 cm) retained the same armour as the PzIV Ausf E: 50 mm in the front, 20 mm on the sides, and 10 mm in the rear. 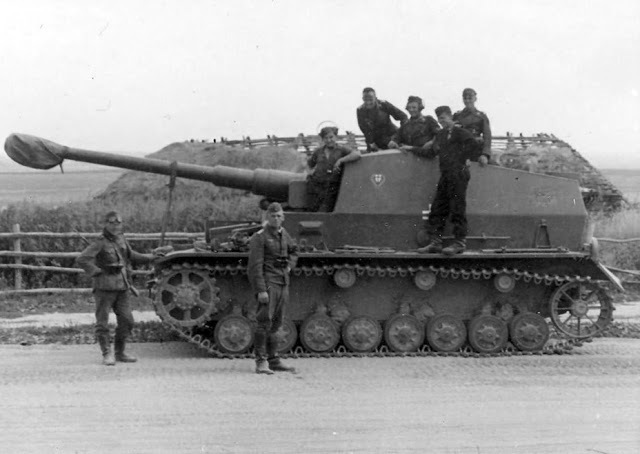 The height of the vehicle was only 13 cm more than that of the base tank, and the mass remained at the level of the PzIV Ausf. E: 22 tons. The main problem with the design was that the engine was a third weaker than the tank's. Servicing the engine was another major problem. It was impossible to take out the engine without removing the gun. In order to at least somehow ease the crew's pain, the center plate of the casemate was made removable. There was plenty of space for the two loaders. On March 31st, 1941, the SPGs were shown to Hitler. After inspection, he ordered that the Pz.Sfl.IV (10 cm) be sent to the army and that the issue of mass production would be resolved based on their performance. Preliminary estimates put the start of production in the spring of 1942. Starting in the spring of 1941, the index Pz.Sfl.IVa was used for these vehicles. On August 13th, 1941, the index changed once more, this time to 10.5 cm K (gp.Sfl.). Some ammunition was housed in the driver's compartment. Shortly before Operation Barbarossa, the two SPGs were sent to the 521st Self Propelled Anti-Tank Battalion. 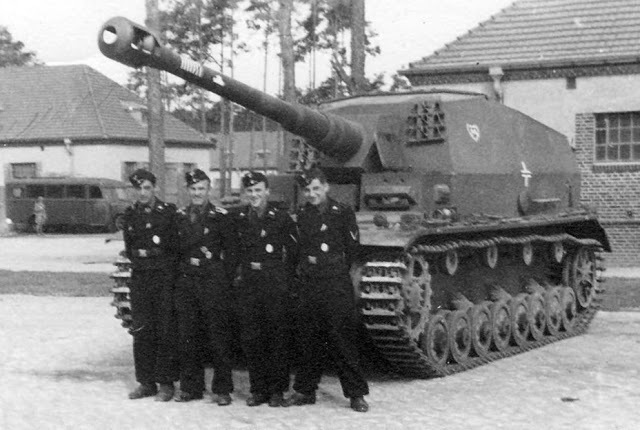 This was the oldest and most experienced unit equipped with SPGs. It was included in the 24th Army Corps, which in turn was a part of Army Group Center. The SPGs met the end of the war in Belarus, alongside the 3rd Tank Division. According to documents, the SPGs fought with Soviet artillery and infantry in June of 1941 instead of tanks. Their first large target was an armoured train. It was attacked by the Pz.Sfl.IVa, but managed to escape. The battalion's commanders remarked on the weak engine for such a vehicle soon after the first battles, which was especially noticeable off-road and on dirt roads. The SPG was nicknamed "Dicker Max" (Fat Max) due to its slow speed. It is not known when the nickname was coined, perhaps it was as late as 1942. The low ammunition capacity was another serious issue. According to front line photographs, it was solved by carrying additional ammunition in crates. The commander's station. Here is where a fire broke out that destroyed one of the Pz.Sfl.IVa. The loss of one of the vehicles in late June of 1941 is connected with the ammunition, a rather odd occurrence. According to the report of the 521st battalion, a fire broke out on board the vehicle during a march on a highway near Slutsk. The weather was hot enough to cause one of the shells to ignite when coupled with the heat of the engine. At least that is the official reason given. As soon as flames broke out, the crew bailed out of the vehicle, which continued to move forward for some time. Then the first explosion was heard, after which the ammunition detonated. The fighting compartment was completely destroyed, and the SPG was written off. Later, the Germans tried to evacuate it, but it was abandoned in the end. Blown up and burned Pz.Sfl.IVa near Slutsk, late June 1941. The remaining SPG kept fighting until at least the end of September of 1941. During this time, the 521st battalion continued fighting in support of the 3rd Tank Division. During battle near the village of Askolki (modern Oskolkovo) in Bryansk Oblast, the Pz.Sfl.IVa fired on a Soviet vehicle column at a range of 3 km. The German crew managed to knock out 4 vehicles, at least one of which was a T-34. The next Soviet tank was knocked out on August 29th from 100 meters. Another, identified as a KV-1, was knocked out from a kilometer away at the village of Devishi. At night, Soviet tankers evacuated the tank. On the next day, another KV-1 was knocked out, and two T-26es that were accompanying it retreated into the forest. This tank was also evacuated. As a result of these battles, it was decided that opening fire at a range of over one kilometer made no sense. It was still unknown whether it was possible to penetrate Soviet heavy tanks at this range. In total, the crew of the Pz.Sfl.IVa claimed 7 tanks destroyed or knocked out by the end of the year. Pz.Sfl.IVa in Belarus, summer of 1941. 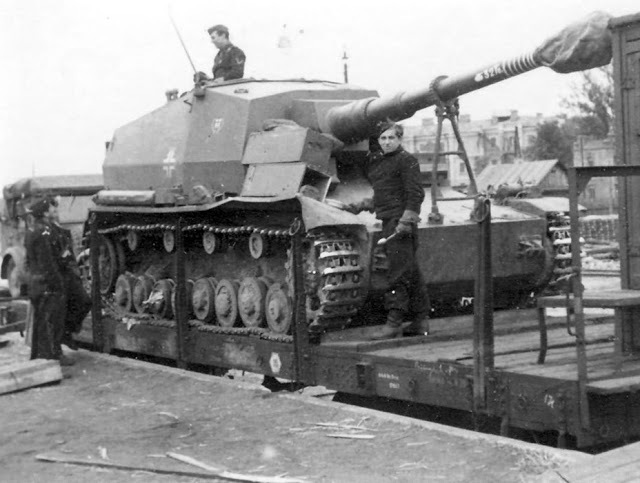 At the end of 1941, the SPG was sent to Grusonwerk for major repairs. At that time, it was decided that the 10.5 cm K (gp.Sfl.) will not be mass produced. There is a theory that this decision is connected with the mixed results achieved in combat, but that is not the case. 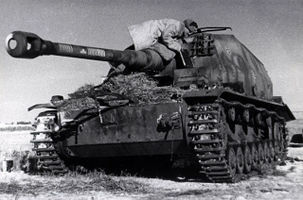 The cause was more likely information that the USSR was designing or even already building tanks heavier than the KV-1. 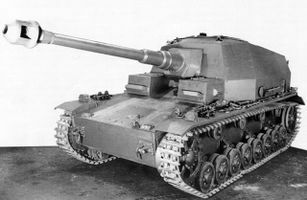 At the time, Germany began working on the VK 70.01 heavy tank, and existing work on medium and heavy tanks was radically corrected. Since there were no results of the effectiveness of the 105 mm gun against the KV-1, there were suspicions that penetration was not achieved. The result of these suspicions was the rejection of the 10.5 cm K (gp.Sfl.). This decision could be considered incorrect. In the early period of the war, this was the most powerful German SPG, capable of fighting any Soviet tank. If it was put into mass production, it could make a lot of trouble for the Red Army. Its subsequent career confirms this hypothesis. A proposal was made to modernize the suspension of the vehicle during repairs, which began in the summer of 1941, but after evaluating the pros and cons the modernization was cancelled. The repaired vehicle was sent to Jüterbog, where the 521st Self Propelled Tank Destroyer Battalion was withdrawn for reformation. Here, the SPG ended up in the company of its heavier brothers: the 128 mm Pz.Sfl.V tank destroyers, also initially built as a bunker buster. According to the table of organization, these vehicles were combined into an independent anti-tank platoon. 10.5 cm K (gp.Sfl.) after repairs, Jüterbog, May of 1942. The front of the casemate now has mounts for spare track links. The barrel carries 7 kill marks. In June of 1942, the battalion returned to the Eastern Front, and was included in the 17th Army Corps, a part of the 6th Army. Work was immediately found for the 10.5 cm K (gp.Sfl. ), which was given the personal name Brummbar ("grouch"). Along with Moritz, Pz.Sfl.V #2, the SPG became one of the main methods of fighting Soviet tanks, Even before the offensive began, the heavy SPGs knocked out 15 tanks. By the fall of 1942, the gun carried 12 kill marks, most of which were put there in July. The SPG is being unloaded in the USSR, June of 1942. Its right fender was dented during loading. The new kill marks are well visible, as are the additional ammunition crates. "2. 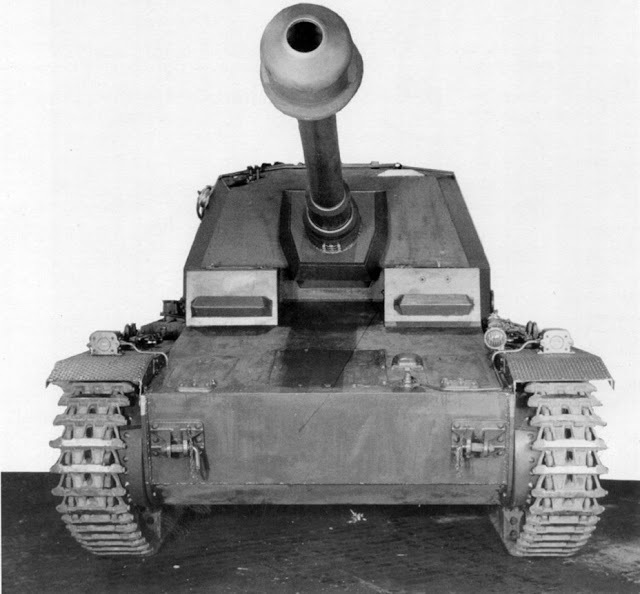 German 105 mm self propelled gun. According to data from British sources, the Germans installed their 105 mm gun mod. 18 (10 cm K.18) into an armoured SPG. The gun fires the mod. 19 high explosive grenade (medium charge) and an armour piercing Panzergranate Rot shell (maximum charge). The maximum range of the 105 mm gun at medium charge is 15,600 meters. The muzzle velocity at maximum charge is 820 m/s." Interestingly enough, this tidbit about the 10.5 cm K (gp.Sfl.) was the only information available to the Red Army during the war. Nobody had any idea that such an SPG was being used between Voronezh and Stalingrad. The USSR also had no information about the use of these SPGs in 1941. The 10.5 cm K (gp.Sfl.) disappears from the list of vehicles of the 521st battalion in November of 1942. This disappearance coincides with the beginning of Operation Uranus. It is also missing from the December report. This could have been the end of the story of this vehicle. However, recently, the website "Victorious May" published the photo archive of "Combat Assault" newspaper correspondent Nikolai Fedorovich Finikov. Completely unexpectedly, it contains the 10.5 cm K (gp.Sfl. ), abandoned in a field. The photo is dated February of 1943. The vehicle carries signs of penetration in the front of the hull, which likely disabled the transmission. Later, the breach was welded over and the vehicle restored. It seems that it managed to fight for some time after that. The captured 10.5 cm K (gp.Sfl.) "Brummbar", Stalingrad Front, February of 1943. The penetration in the front of the hull and winter camouflage are visible. The fact that there is no information about the 10.5 cm K (gp.Sfl.) in GABTU's documents in 1943 is surprising, given this information. It seems that the trophy teams were uninterested in this unique vehicle, and after combat ended it was simply scrapped. Despite such mixed results, it's hard to call the 10.5 cm K (gp.Sfl.) useless. Nearly 20 knocked out or destroyed tanks are a good demonstration of the SPG's combat potential. The experience in designing the 10.5 cm K (gp.Sfl.) was used during the creation of new SPGs on the PzIV chassis, and even the work on a 6-wheeled variant did not go to waste. 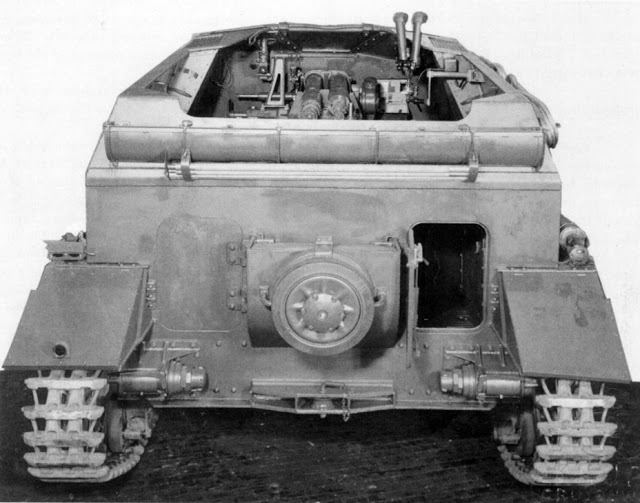 An SPG on that chassis was built in small numbers and fought near the 10.5 cm K (gp.Sfl.) final battlefield. This page was last modified on 23 July 2018, at 09:50. This page has been accessed 320,177 times.